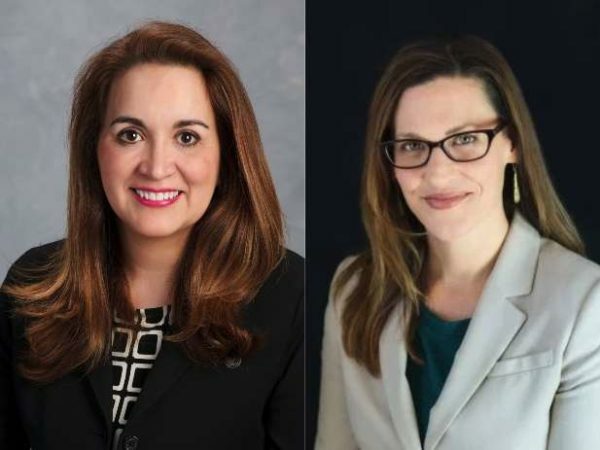 With the incumbent stepping down, two candidates are running for the Hunter Mill District seat on the Fairfax County School Board. Earlier in January, Hunter Mill District Representative Pat Hynes said that she won’t seek re-election. Her term expires at the end of 2019. 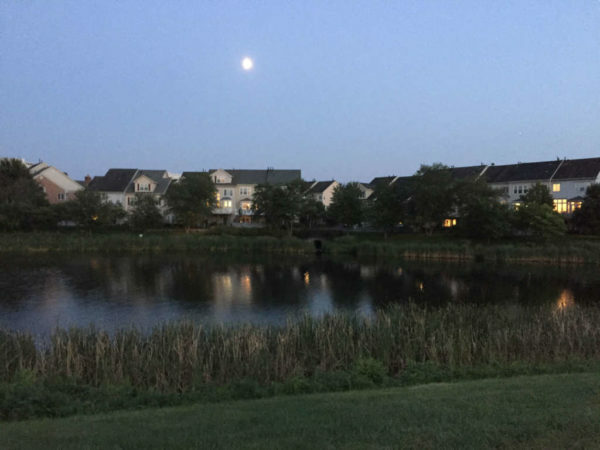 Both Meren and Drain point to their experiences as parents of children who are either currently attending or went to Fairfax County public schools as one of the reasons why they are running for the seat. 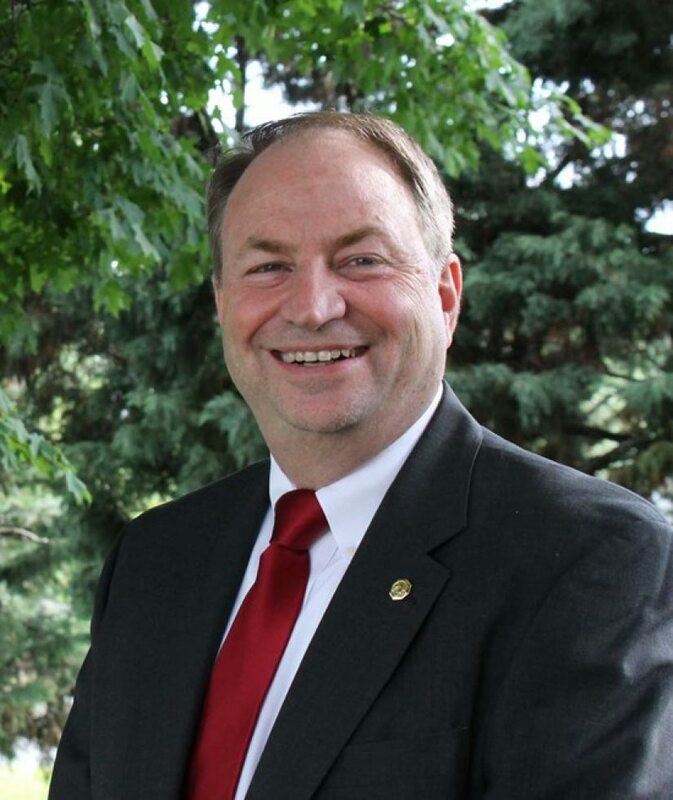 Meren’s career has focused on education public policy and programming. She worked at the U.S. Department of Education and as an independent communications consultant at MKM Strategies. Meren has also been involved with advocacy and community organizations. She began co-leading the #IamFCPS grassroots campaign after a $75 million budget cut hit FCPS in 2015. The campaign secured $60 million of the proposed cuts, resulting in educator pay increases and measures to help address growing class sizes, according to her website. 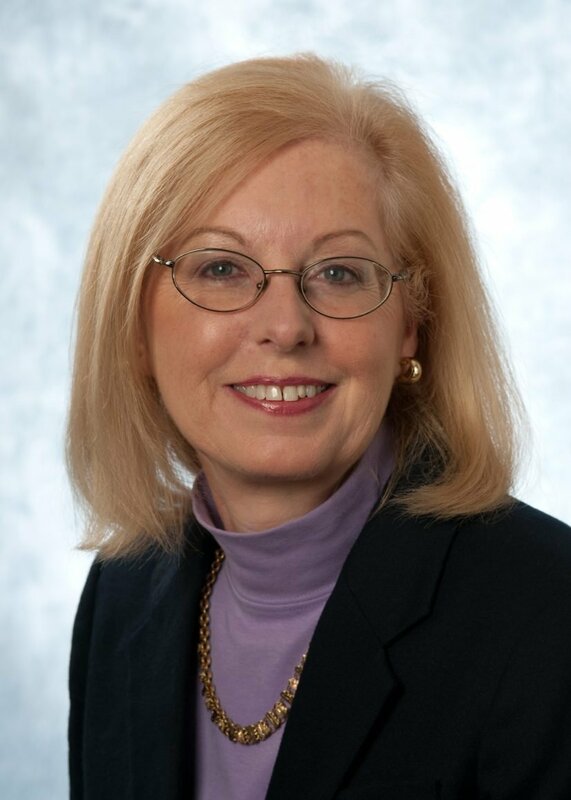 She is also currently a member of the Fairfax County School Board’s Human Resources Advisory Committee. Drain has more than 20 years of sales experience with information technology products and solution-based services, including with Verizon and AT&T. She is also the chief executive officer and founder of Random Words Marketing Group. She relocated from Mexico to the U.S. in 1999 with the Hewlett-Packard Corp. and became a U.S. citizen in 2008, according to her website. Since 2011, she has produced and hosted “Cafe Latino Radio,” a bilingual talk radio show, and in 2015, she launched Cafe Latino TV — both shows focused on sharing success stories from small business owners and people from local nonprofits over a cup of coffee. This Saturday (Jan. 26) she plans to host a “meet and greet” from 3-5 p.m. at Glory Days Grill (1400 North Point Village Center). Hunter Mill District Representative Pat Hynes announced today (Jan. 9) that she won’t seek reelection to the Fairfax County School Board. Hynes has been a member of the 12-member board for the last seven years. Previously, she was an elementary school teacher in the county’s public schools from 2002 to 2011 and has worked as a lawyer with Simpson, Thacher and Bartlett in New York City and community organizer, according to her bio. As you may know, my current term as your school board member expires at the end of 2019. It has been the privilege of a lifetime to represent the welcoming, resilient, creative people of Hunter Mill for the last seven years. But I’ve decided not to seek reelection after this term. My first calling is the classroom and I’ve been teaching full time in Arlington these last two years. (The law does not allow me to serve on the board and teach in FCPS at the same time.) I was hopeful that I might be able to balance the time commitments of both jobs, but it really is not reasonable and I find myself stretched too thin too often. I look forward to the next year of work and progress on your behalf, but I also think it’s time for someone else to step up. I’m sure we will all be engaged in the November election and I have no doubt Hunter Mill will choose an excellent new school board member. Her term expires at the end of 2019. Until then, she outlined in her newsletter several school board issues on her radar, including climate change and equity. Poll: Are You Happy About School Starting in August Next Year? Last week, the Fairfax County School Board approved an August start date for the next school year, marking the first time in decades that area schools will start before Labor Day. That means school will also let out earlier next year on June 15. In past years, students have gone to class as late as June 25. Outgoing FCPS Superintendent Karen Garza said earlier this year the change is being made to provide more instructional time before winter break, provide enhanced flexibility to help students and school staff members meet college application deadlines and to end the school year earlier in June. Additionally, some FCPS parents have said they are glad for the change because letting out earlier in June will afford their children better summer internship and enrichment opportunities. ‘Traditional’ summer vacation — In a poll issued to FCPS families prior to the school board’s vote, 84 percent of those against the earlier start date said they preferred a “traditional” summer vacation schedule, giving kids all of August off before starting school in September. Others said it made no sense to them to start school before Labor Day when right away in the second week of school, they have a day off to observe the Labor Day holiday. Sixty-four percent of families said the new schedule would disrupt long-held vacation plans. 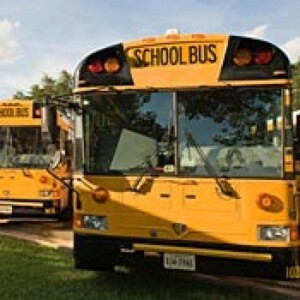 Shortening of summer/temporary status of waiver — Twenty-eight percent of families against the earlier start date pointed out that the waiver from the state, allowing FCPS to start school before Labor Day — which has long been mandated via the 1986 “King’s Dominion Rule” — is temporary, only allowing the district to start school in August through the 2019-20 school year. Many parents said they did not support the earlier start date if it is going to be temporary, especially if they would have to switch back again in a few years once the waiver expired. Others pointed out that, in the first year of implementation, their children are losing a week of summer vacation with the early start. Hot temperatures in August — Many parents say they are worried about students being in hot, under-air-conditioned classrooms in summer temperatures that are often in the 90s. What do you think of the new August start date? Vote in our poll and leave your comments below letting us know why you voted the way you did. 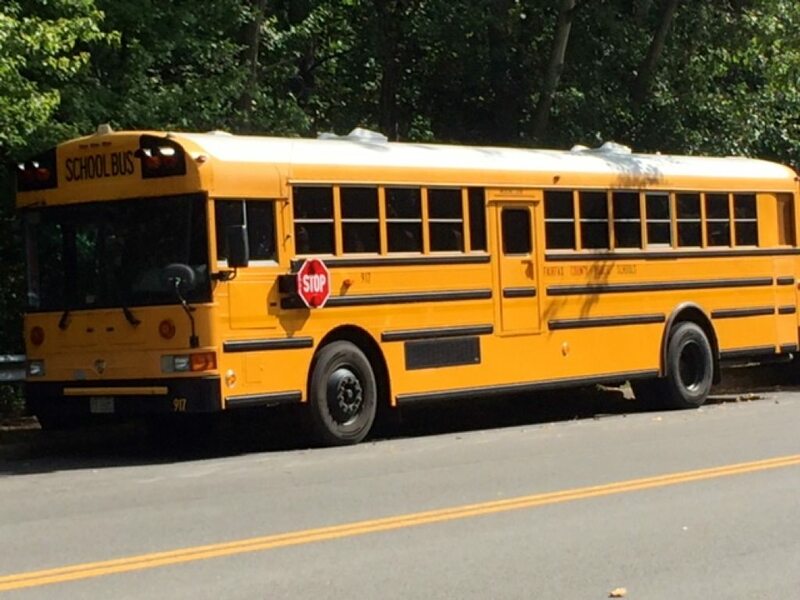 It’s official: The first day of school in Fairfax County next year will fall in August, marking the first time in decades that area schools will start before Labor Day. The Fairfax County School Board approved the calendar for the 2017-18 school year this week, with school starting on Monday, Aug. 28, and ending earlier than usual, on Friday, June 15. 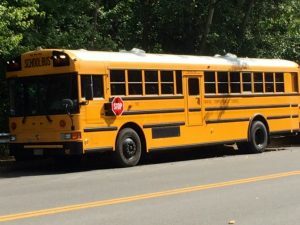 Although the law in Virginia — called the “Kings Dominion Rule” — mandates that school should start after Labor Day, Fairfax County Public Schools applied for a waiver from the commonwealth. 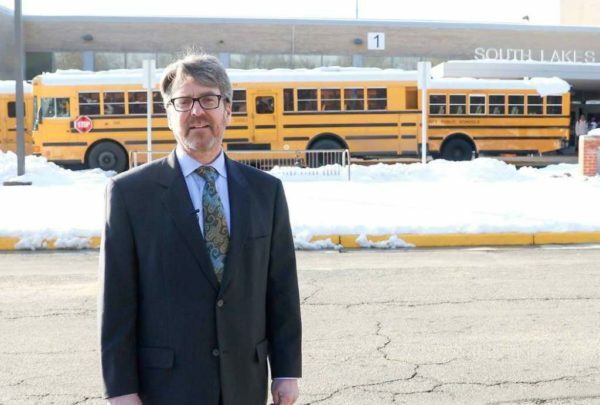 FCPS was informed in February that it could get the waiver until at least the 2019-20 school year because the district had canceled school an average of at least eight days per year in at least five of the past 10 years due to inclement weather. In the 2013-14 school year, FCPS was forced to add three days to the end of the school year due to missing more than the maximum number of school days allowed, Washington Post reported. Following that school year, discussions began about starting the instructional calendar earlier. This past spring, the district polled families to gauge their support for moving the first day of school into August. Parents who participated in the survey were fairly evenly split, 52 to 47 percent, between those in favor of and those opposed to the earlier start date, respectively. More than 60 percent of responding FCPS staff said they favored the change. Outgoing FCPS Superintendent Karan Garza had long advocated for the change as well. “These changes are being made to provide more instructional time before winter break, enhanced flexibility to help students and school staff members meet college application deadlines, and to end the school year earlier in June,” FCPS officials said Thursday. The 2017-18 school year will include a full two weeks off in winter, letting out Dec. 18, 2017 and resuming on Jan. 2, 2018. The full 2017-18 calendar is on the district’s website. The Fairfax County School Board has a new chair and vice chair. The school board has elected Sandy Evans (Mason District) as chair and Jane Strauss (Dranesville District) as vice chair for a one-year term. The chair and vice chair assumed office at the July 14 School Board meeting; they are elected by School Board members during the Board’s annual organizational meeting. This ends the one-year term of Hunter Mill rep Pat Hynes, who was elected as chair in July 2015. Evans, who was elected to the School Board in March 2010, served as vice chair during the 2015-16 school year. She is the former chair of the School Board’s School Health Advisory Committee and served on the Board’s Transportation Task Force. 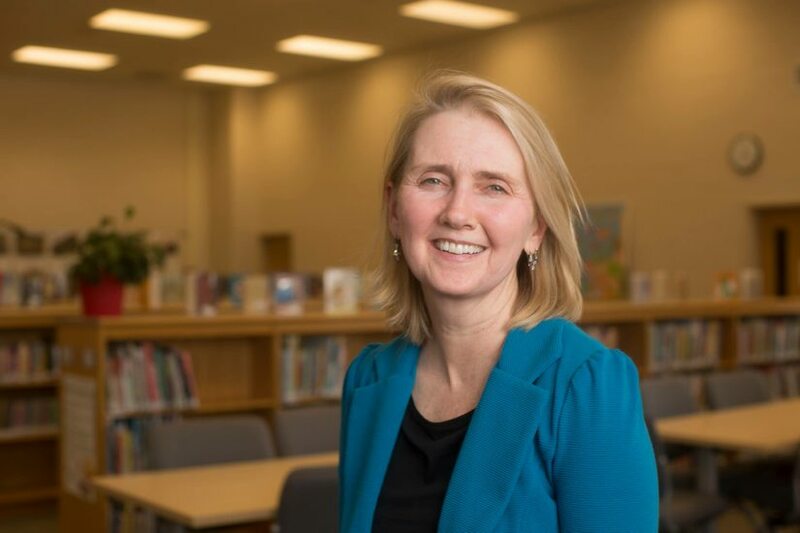 Evans is a member of the steering committee of the Northern Virginia Healthy Kids Coalition; founding member of the Fairfax Education Coalition; and co-founder of Start Later for Excellence in Education Proposal (SLEEP). She served as the legislation committee chair of the Fairfax County Council of PTAs and as president of the Sleepy Hollow Elementary School PTA, and is a former staff writer for the Washington Post. Evans earned her bachelor’s in journalism from the University of Maryland-College Park. 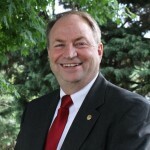 Strauss has been active in education for over 30 years. She is a former elementary and preschool teacher. She obtained an M.A.T. from Harvard Graduate School of Education and her B.A. in history from George Washington University. 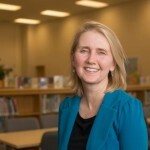 Strauss is past president of the Franklin Sherman PTA and the Fairfax County Council of PTAs and past chair of the council’s education and budget committees. She has served on numerous education and youth affairs committees including the FCPS Career and Technical Preparation Task Force, the Division Planning Committee, the Citizens Bond Committee, and the Fairfax Framework for Student Success. She served as Board vice chair in 2000 and Board chair in 2001 and 2011. Next up for the FCPS board: a work session on Thursday to review new procedures for protecting transgender and non-gender conforming students. The school board will also discuss a teacher and administrator compensation study at a work session today. The Virginia High School League (VHSL) said last week it will move 14 state tournament events away from Liberty University. However, the league also says the move has more to do with geography than reaction to insensitive comments made by Liberty President Jerry Falwell Jr. and reaction from the Fairfax County Public Schools Board. 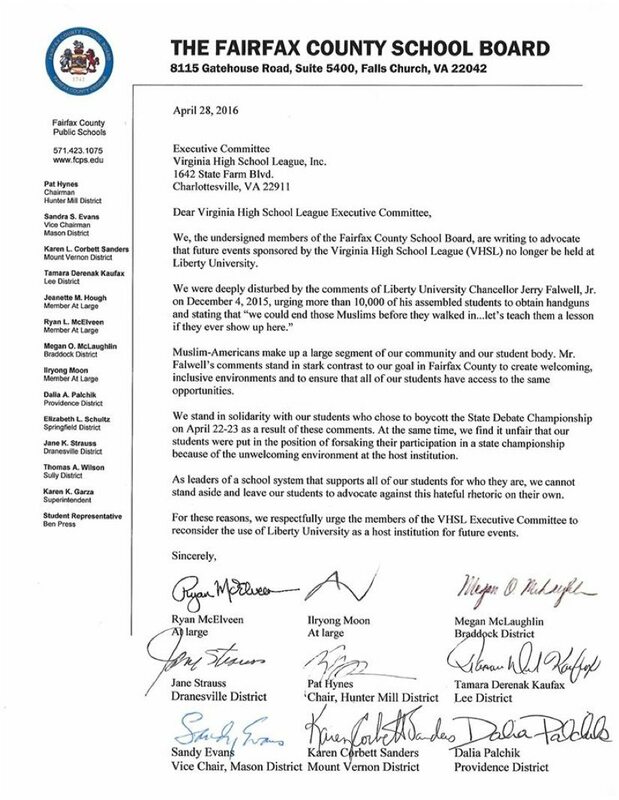 Nine of the 12 FCPS Board members wrote to the VHSL late last month advocating that future VHSL events no longer be held at the Lynchburg, Va., school. Nonetheless, VHSL’s Executive Committee says beginning in 2016-17, 14 state tournaments — including the 2016 Group 4A and Group 3A football championship games — will be held elsewhere. Those football championships have been held at Liberty for the last 18 years. Also moving will be Group 4A and Group 3A spring sports championships in baseball, softball, boys and girls soccer and boys and girls tennis. 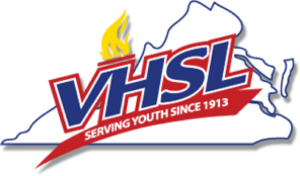 VHSL assistant director for compliance Tom Dolan told the Roanoke Times last week that a number of member schools sought to move the football championship games to a different part of the state for other reasons. “There’s been a lot of requests from membership for moving things geographically, trying to look at some different venues, mixing it up a little,” Dolan said. Dolan said he could not determine whether Falwell’s comments had any impact on the VHSL’s departure from Liberty. Dolan said the VHSL had been studying potential moves and seeking prospective host cities since October. 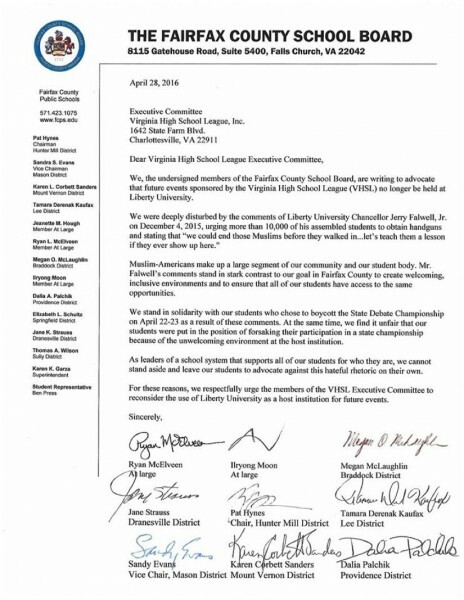 Hynes, who also serves at the school board chair, was one of the board members who signed the letter to the VHSL. Ready to vote on Nov. 3? If not, come to a forum sponsored by the League of Women Voters at Reston Community Center on Saturday. The Hunter Mill Candidates Forum is at 2 p.m. at RCC Hunters Woods. Expected to appear is hunter Mill Supervisor Cathy Hudgins, who is running unopposed, as well as school board candidates for the Hunter Mill seat. Running for school board is Pat Hynes, the current FCPS board chair who is seeking re-election to a second term, and challenger Mark Wilkinson, and Oak Hill businessman. The school board race is Reston’s only contested election this fall. State Sen. Janet Howell (D) and Del. Ken Plum (D) are also both running unopposed. Hynes, of Reston, is a former lawyer and teacher who has served on the board since 2012. See previous Reston Now Q-and-As with Pat Hynes and Mark Wilkinson. Photos: Pat Hynes (top) and Mark Wilkinson (bottom).